thelodonts are successive outgroups to osteostracans, galeaspids and higher forms (see Box 3.1). Anaspids are known from the Silurian and Devonian (Blom et al., 2002). 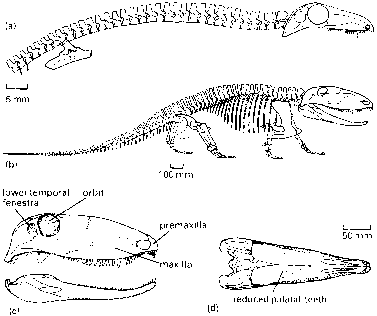 Pharyngolepis (Figure 3.9(a)) is a cigar-shaped animal 200 mm long, with a terminal mouth, small eyes, a single dorsal nostril and a covering of irregular scales and plates in the head region. The body scales are long and regular, and arranged in several rows. There is a pectoral spine and two paired fins beneath, and a tail fin on top of the downwardly bent tail. Thelodonts are known mainly from isolated scales in the Ordovician, and abundant scales and rarer whole specimens in Upper Silurian and Lower Devonian rocks of various parts of the world (Marss and Ritchie, 1998; Donoghue and Smith, 2001). 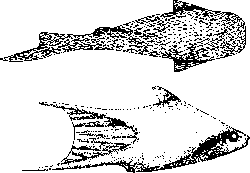 Phlebolepis (Figure 3.9 (b, c); Ritchie, 1968) is 70 mm long, with a slightly flattened body, a broad snout, an eye at each side and a wide mouth. There are lateral flaps, a dorsal and ventral 'fin' near the back, and a long lower tail fin. The body is completely covered with small scales, and there is no sign of bone shields in the head region at all. In certain thelodonts, there are eight small gill openings beneath the lateral fins. Some thelodonts from the Early Devonian of northern Canada (Wilson and Caldwell, 1998) had a deep, laterally compressed body shape (Figure 3.9(d)). The tail is deep and symmetrical, with an upper and lower fleshy lobe. The body surface bears several different kinds of scales, and ten gill openings extend in an oblique line behind the eye. The fossils are well enough preserved to show that these thelodonts had a large stomach, seen also in Turinia (Donoghue and Smith, 2001), and this suggests that some thelodonts at least were deposit-feeders. The scales (Figure 3.9(e)) are lozenge-shaped, concave beneath, and rising to a point above. The exact shape of the scales and the arrangement of the spines and nodules are used to identify thelodont species based on isolated specimens. In cross-section (Figure 3.9(f)), the scale is seen to be made from dentine around an open pulp cavity, as in a tooth, although it lacks enamel and it shows the typical composition of scales and tubercles of many basal vertebrates.